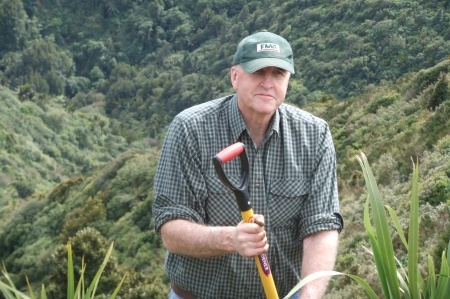 Living Legends planted 10,000 native trees in the Manawatu Gorge Scenic Reserve, as part of Department of Conservation’s Manawatu Gorge Biodiversity project. This project is a major initiative involving local authorities, transport agencies, DOC, community organisations, Iwi, and individual land owners. The project has a vision to raise this dramatic landscape to a model of restoration for biodiversity and recreation at a national and international level. The upgraded Gorge track is already a must do for walkers from across the country, experiencing the outstanding views not seen from the gorge itself and a wonderful piece of hardwood/podocarp forest. With the help of our volunteers and Rugby Legend Sam Strahan, Living Legends has been able to bolster the efforts of these committed local groups through our plantings, both on an old fire scar high on the hillside and in the recreation area alongside the river. Living Legends will continue to oversee the maintenance of this planting project in conjunction with the Department of Conservation, who will care for it for years to come. Born in Palmerston North on Christmas Day 1944, Sam Strahan was educated at Apiti School, where he recalls his earliest rugby memory, playing for the Apiti School Midgets. He then went on to Huntley Preparatory School, and Wanganui Collegiate. After only three games for his home club, Oroua, in 1965 he was selected to represent Manawatu, and attracted the attention of national selectors who included him in the Junior All Black team against the 1966 Lions. In 1967 the All Black selectors were searching for a lock to partner another of Living Legends “Rugby Legends”, Colin Meads. They went to Napier to study Manawatu’s Ranfurly Shield challenge, after which the selector found his lock forward after seeing some outstanding play from Sam. By the end of the 1967 season the 1.95m, 101kg lock was off to Britain with the All Blacks where he partnered Colin Meads in each of the four Internationals. The young farmer had gone away as a relatively junior player but his performance improved with each game on a tour which is regarded as one of the most successful ever, being unbeaten in its 17 matches. After 23 games for the All Blacks he had never been in a losing team, however, in 1969 he lost his Test position to Taranaki’s Alan Smith. Strahan returned to top form in 1970 though, touring South Africa and playing the best rugby of his career, appearing in the first three Tests. After his last All Black game in 1973, Strahan played once for Manawatu then later retired from all first class rugby. After hanging up his boots Sam Strahan remained involved in rugby, as coach to his club team Oroua, and also within the Club’s administration. In 2002, the Oroua Rugby Football Club made Strahan a life member of the Club, and he has also served as President of the Manawatu Rugby Union, of which he is also a life member. He says the best piece of advice he could give to young players now is to take advantage of every opportunity that comes their way.